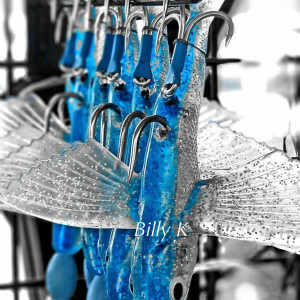 The Boston Big Game Fishing Club Kite is well known throughout New England as a force to be reckoned with when fishing large baits. The Boston Big Game Kite is extremely stable, thanks to a windsock below the kite unit that features a mesh end that allows wind to flow through, providing modest resistance. To make the kite fly to the left or right, just move the center knot ¼ in either direction. Its a good idea to mark the center of the line with a magic marker so you have reference point. Wet or dry, the Boston Big Game Fishing Club Kite will fly when wind conditions range from 5 to 20 miles per hour. On those days when the wind is really light, the higher the kite gets, the more stable the wind and the more likely it will remain flying. Spectra line has far less wind resistance than thicker monofilament and is a better choice for flying the kite on light wind days. On days when the wind is strong, you can make the kite fly farther behind your boat by flying it on heavier monofilament line (100 LB 200 LB). You can also hang or secure a large flag (3 X 5) on the main kite line 40 60 feet below the kite. Standard flag clips will work just fine. The extra wind drag on the main kite line helps the kite to stay down wind. This fishing kite is not for the faint of heart. Make sure you’re fishing a minimum of 80 lb. main line and attach a safety leash to your rod and reel. Legend has it that there are still rods and reels orbiting the earth attached to a Boston Big Game Fishing Club Kite! 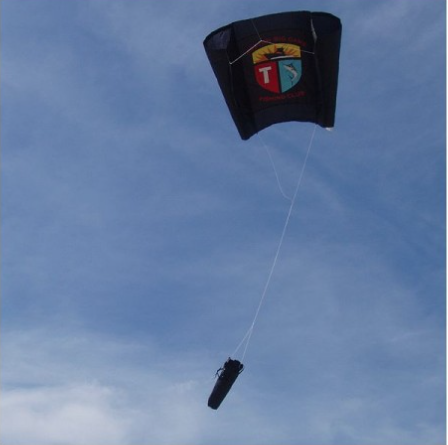 The kite easily breaks down and is conveniently stored within the windsock.